Warning: this file contains pictures that may be distressing for people. Rabbits are often considered as difficult animals in relation to general anesthesia. This may relate to the fact that the doses needed to induce and maintain anesthesia and those producing toxic effects are close to each other, and to the variety of observed secondary effects related to stress and cardiac or respiratory reactions. Indeed, rabbits are pre animals, which are easily distressed in a new environment (new persons, new odors, new noises, restrain, etc.). They may attempt to escape during the examination when frightened, when restrained too strongly, or poorly manipulated. This will affect various hormonal pathways and physiological processes, notably the release of catecholamines in the blood and a slowdown of the digestive system activity. The rise of catecholamine can have dramatic effects on the cardiac and respiratory activities, which lead to secondary adverse complications such as altered response to the surgical anesthetic drugs. Pain also triggers hormonal and physiological responses, it is thus necessary to give analgesic medication, when potentially painful procedures need to be done (e.g. blood sampling). • respiratory and cardiac monitors have no upper-limits set lower than use commonly observed in rabbits and other small animals. It is important to do a full clinical examination and verify the general condition of the rabbit in a calm atmosphere. A complete examination, including accurate weight, a CBC, a blood biochemistry panel, X-rays, ultrasound or MRI, urinalysis, will help determine the health condition of the rabbit. Particular attention should be paid to respiratory and digestive troubles. It is best to refrain from anesthesia and postpone surgery if a rabbit presents any of the aforementioned problems. If the rabbit is found healthy, no major problems should be encountered. • IV (intravenous) administration, directly in the marginal ear vein, lateral saphenous vein, or the cephalic vein, after placement of a catheter. Long-term catheterization of the jugular vein is not recommended; in rare cases, swelling of the head has been reported. 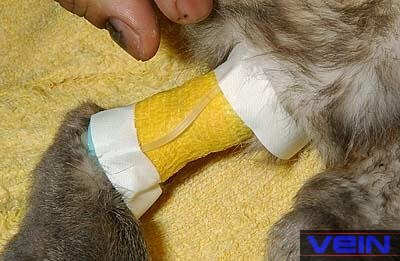 • SC (subcutaneous) administration is slow and not very effective in case of severe dehydration. • IP (intraperitoneal) administration is slow and not very effective in case of severe dehydration. • Intraosseus administration is useful when a prolonged administration of fluids is foreseen. Placement of a catheter in the ear of a rabbit. • The concentration of volatile anesthetic, used to maintain anesthesia, must remain low. Preemptive analgesia by means of opioid agents, 30 to 45 min prior to surgery is indicated for this purpose (e.g. fentanyl/fluanisone (EU), fentanyl/droperidol (USA), or more commonly acepromazine/butorphanol). • A rabbit is suffering from upper or lower respiratory problems, or when the irritable isoflurane gas is used for surgical anesthesia. The pre-anesthetic drug will help reduce the production of saliva or bronchial secretions. The use of atropine is not indicated in rabbits. Indeed, around 30 to 50% of all rabbits possess an endogenous atropinase enzyme. Glycopyrolate is the anti-cholinergic drug of choice in rabbits. • Immediate reduction of post-surgical pain is needed. Opioid analgesic drugs like butorphanol or buprenorphine can be given during the pre-anesthetic preparations. • A rabbit is stressed and anxious. The use of benzodiazepines (e.g. diazepam) provides good tranquilization and muscle relaxation. The can be particularly helpful, if intubation of the rabbit is needed during the surgical anesthesia stage. The various pre-anesthetic agents that can be used in rabbits are listed in a table. Moribund, life expectation around 24 h.
Thanks are furthermore due to Akira Yamanouchi (Japan) for the permission to use the pictures from VEIN (Veterinary Exotic Information Network, http://vein.ne.jp/). Cantwell S.L. Ferret, Rabbit and Rodent Anesthesia. In: Analgesia and Anesthesia. Vet. Clin. N. Amer. Ex. Anim. Pract. 2001. pp: 169-192. Flecknell P. BSAVA Manual of Rabbit Medicine and Surgery, Gloucester, UK: British Small Animal Veterinary Association 2000. Laber-Laird K. Handbook of Rabbit and Rodent Medicine, Pergamon Veterinary Handbook Series, Butterworth Heinemann 1996. Murray M.J. Rabbit Anesthesia for Veterinary Technicians. Tufts Animal Expo Conference Proceedings, 2001. Paddleford R.R. Manual of Small Animal Anesthesia. 2nd ed. Saunders, Philadelphia, 1999.